T-2/90 ° diagonal prism (BaK4 glass) with 35mm free aperture terminal objective side: 2 "or 1¼"
Prism made in accordance to Zeiss-norms, multi-coated, solid metal case, both sides T-2 connection threads, resulting in extremely short design and adaptable to each telescope system. Not just the housing is significantly better and the prism is greater, also the planarity and the conformality of the prism faces are about 5x better than standard prisms in plastic housings. The only difference between them two is the adaptation to the binoviewer. They save ca. 80mm of glass path; a binoviewer consumes ca. 110mm, so you need only ca. 30mm of additional backfocus compared to a normal eyepiece without binoviewer. Otherwise, we'd recommend using mirrors on a mirror telescope to avoid possible colour abberations which can be caused by a prism. Does it make sense to use a T2-2" clicklock on this for a 2" eyepiece? Or it's better to just use 1.25" clickclock and eyepiece given the connection interface size is only T2. you will see that the field is vignetted. I would like to know if the Baader Planetarium Prism T2 Diagonal 32mm MaxBright (#2456005) and also the Baader Planetarium StarDiagonal Prism T2/90 ( #2456095 ) have the BBHS silver coating on the prism ? I have ask about this here in the states but no one seems to know the answer. The 32mm star diagonal (#2456005) is produced in the regular way - just like prisms are being made since four hundred years - without ANY coating applied onto the hypothenuse (reflecting) face. 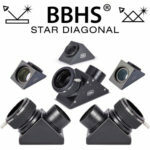 Please also check our website, nowhere do we state that this star diagonal would feature our BBHS-coating. Any beam of light that will hit that uncoated surface under exactly 45° of incoming angle will undergo a "total reflection" (as soon as there would be a regular antireflection coating applied onto that reflective face, the performance would suffer greately). For ages Carl Zeiss had preferred the total reflection of prisms versus the reflective surfaces of mirrors, because until recently mirrors did tend to age (produce haze) very quickly. For the BBHS T-2 prisms we needed perfect reflection also for very short focus telescopes and we wanted to produce a prism that could be used for a wide range of purposes - also for other reflective angles than exactly 45°. In this sense the BBHS-coating applied onto the T-2 prisms offers "another league" of functionality - and the hard silver coating will keep this optical surface to stay clean for ages, whereas the open glass surface of the 32 mm prism will be prone to collect some dust or even dew over time. Still the 32mm prism is mounted within a precision metal housing, suitable to carry the weight of the Maxbright and heavier binocular viewers asf. It offers the very shortest light path for attaching - say - a Maxbright Bino onto any telescope due to its T-threads. In this way we regard it as a very good solution for any low-cost binocular viewer, since the optical polish of the prism faces is made very precise, with the extended optical distance in mind that adds itself into the light path when putting the added mechanical length of a binoviewer between the 90° prism and the eyepiece focal plane. Regular 90° prisms often feature a plastic housing and are only made to supply sufficient optical quality for an eyepiece to be mounted directly atop such a prism face. Conclusion: each of these two prisms (32mm as well as BBHS T-2) are top performers within their respective price range. And if you plan to ever use a Mark V Binoviewer, the T-2 BBHS prism will be the first and most useful investment for an undeteriorated viewing experience.